Our expertise in tutoring for math, physics, chemistry and more is vast and our customer service is second to none. We handle everything from scheduling private tutoring lessons to conducting group studying programs. We are tutors for students at Texas A&M University, The University Of Texas in Austin, Sam Houston State in Huntsville, St. Edward's University and Texas State University in San Marcos, TX. 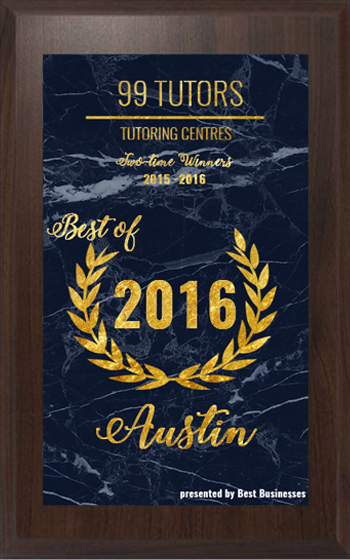 Our tutors also serve some of Texas’ fastest growing schools Blinn College and Austin Community College. Why do students prefer 99Tutors? Don't take our word for it, hear from our students! I used 99Tutors to get a private tutor for Biology, Psychology and Art History! The tutor matching process and the service was very good and I would recommend it to those needing private tutoring help. My tutor Hope provided excellent support for my Econ 202 class homework and test prep. This tutoring service is excellent and I would recommend it. My tutor was very experienced in calculus 1. I am very satisfied with my tutoring and service from 99tutors , the professionalism and eagerness to make sure that all students are prepared academically. 99tutors.com has provided me with satisfactory service , my grade and tutor was very good and I would highly recommend 99tutors to all of my friends. Tutoring is going very well. It has cleared up a lot of confusion with computer science. The tutor is awesome, he really knows his stuff and thus far, it's been a good experience. I am satisfied with the response after I filled out my application. My tutee contacted me as soon as I was able to contact them after I got their information. Also, the tutoring sessions are going well and I feel that they are understanding the material a lot better and more easily. I have been extremely satisfied with 99Tutors so far. I received a response within a week of filling out an application. The complete process occurred very quickly and I have enjoyed working with my tutee. The communication from 99Tutors has been helpful and informative. My tutoring is going great! I like my tutor and we have a scheduled time to meet before every test and its a great and working. Well for one I can say for sure that my tutor Zach responded to me within a day of me filling an application and it only took a couple of hours after he emailed me to find out when I wanted to meet him for the first time. He has maintained constant communication on how I am doing with my studies and if I'm not understanding he is quick to ask when I would like to meet up with him. He has been an exceptionally well tutor and is extremely personable so it helps with the flow of studying. Personally I would recommend 99 tutors to any and everybody who may have just the slightest trouble. We meet regularly and are punctual. Everything is great! I was informed about my tutor within 24 hours of submitting my information and payment and was in almost immediate contact with my tutor after that. We generally meet every Tuesday and Thursday at the library. I feel better with the material and although I still feel like I have long way to go, I feel confident that the tutoring is helping. I was very pleased with the speed of everything; I got a quick response from the beginning with the application to setting me up with a tutor. My tutor is amazing, he is really good and has helped me a lot, I am not one to pass math but I just got my first test back and I passed with flying colors, I could not be more happy with 99 tutors and the tutor I have. "Treat people as if they were what they ought to be, and you help them to become what they are capable of becoming." " Much education today is monumentally ineffective. All too often we are giving young people cut flowers when we should be teaching them to grow their own plants." " Never stop dreaming, never stop believing, never give up, never stop trying, and never stop learning." " The difference between school and life? In school, you’re taught a lesson and then given a test. In life, you’re given a test that teaches you a lesson." After we get your application and administrative fee we have one of our 99Tutors get in touch with you and set up a time and place for your first meeting. If you have questions about our private or group tutoring prices contact us directly to learn about our services and rates by emailing us at info@99tutors.com .
" They may forget what you said but they will never forget how you made them feel." "
"Thought flows in terms of stories — stories about events, stories about people, and stories about intentions and achievements. The best teachers are the best storytellers. We learn in the form of stories." "A teacher who can arouse a feeling for one single good action, for one single good poem, accomplishes more than he who fills our memory with rows and rows of natural objects, classified with name and form." " Ideal teachers are those who use themselves as bridges over which they invite their students to cross, then having facilitated their crossing, joyfully collapse, encouraging them to create bridges of their own." "Learning is finding out what we already know. Doing is demonstrating that you know it. Teaching is reminding others that they know just as well as you. You are all learners, doers, and teachers." The Austin Community College District is a community college system serving the Austin, Texas metropolitan area and surrounding Central Texas communities. Bryan Independent School District is a public school district based in Bryan, Texas. It also serves the towns Kurten and Wixon Valley and rural areas in northern Brazos County, and a small portion of Robertson County. Stephen F. Austin State University is a public university located in Nacogdoches, Texas, United States. Founded as a teachers' college, the university was named after one of Texas's founding fathers, Stephen F. Austin. 99Tutors is always looking for tutors to join our team.